TMF stress is why clinical documentation might be the least loved domain of clinical operations. At LMK Clinical Research Consulting we know the toll TMF stress can take on your team and your health. Too often, clinical teams fall into a cycle where attention and resources are consistently diverted away from the TMF, only to return at that last moment—often when it is too late to make a meaningful difference. Clinical professionals want to succeed in their roles, but poor resourcing practices and institutionalized deprioritization of the TMF continually narrow the path to TMF success. Clinical professionals, therefore, often feel that their TMF is out of their control. This loss of faith in one’s self-efficacy—both in and out of the workplace— is one of the most powerful agonists of stress, eroding job performance, stoking burnout, and endangering the health of the TMF. In the past twenty years, the term mindfulness has come into popular use and has more recently been integrated into the workplace. Although not always easily defined, at its core, mindfulness is a state of attention to the present. It has been more formally defined as “the basic human ability to be fully present, aware of where we are and what we’re doing, and not overly reactive or overwhelmed by what’s going on around us.” Jon Kabat-Zinn, considered by many the father of secular mindfulness, first brought mindfulness into his stress-reduction practice in the early 90s. Popularized through several of his books, dozens of awards, and hundreds of media appearances, Zinn’s brand of approachable mindfulness, which he called mindfulness-based stress reduction (MBSR), revealed itself to be a powerful tool for stress reduction, and it’s effectiveness has been demonstrated in several randomized clinical trials. Seeing the well-publicized benefit to those battling stress and illness, athletes and professionals, seeking a boost in performance, also began to practice MBSR. From football payers to executives, those who incorporated mindfulness into their daily routines saw their stress reduce, memory improve, focus increase, and their relationships with others strengthen. As MSBR adoption grew, it became clear that nearly every person and organization could benefit from the practice of mindfulness. Stress and toxic emotions can upend a workplace. These toxic emotions, if not controlled, break down the human bonds that support critical processes. The health of your TMF depends on harmonious working relationships. Your TMF brings together thousands of document stakeholders from across the country or the world, all with unique beliefs, goals, and ideas. Unfortunately, due to the pressing issues of day to day trial conduct and limited clinical resources, TMF challenges can grow unnoticed only to become a catastrophe before a TMF’s closure or an unexpected audit. The result of TMF disharmony is a flurry of activity at the end of a trial resulting in negative emotions and strained relationships across the team. At LMK we’ve discussed the role of blame in TMF disharmony before. The importance of the human element of TMF management is why we at LMK have chosen to be an eTMF agnostic company. We fully recognize the transformative power of technological solutions including the eTMF, but also recognize the tremendous power and importance of your team. LMK’s eTMF agnostic approach means that regardless of the TMF format your organization uses (electronic, paper, or hybrid), LMK believes the building blocks of success come from well-designed user-friendly TMF processes. We believe the most important features of your TMF are people, and that innovative TMF education is as important to the future of the TMF as any technological advancement. Empowering the people behind the TMF with the right tools, knowledge, and processes is the best and most efficient pathway to TMF health. Putting the humans behind the TMF first means focusing on the health and wellbeing of TMF stakeholders. When happy and healthy, TMF stakeholders form a productive and harmonious team capable of TMF excellence. MSBR can be an indispensable tool for fighting TMF stress and disharmony. 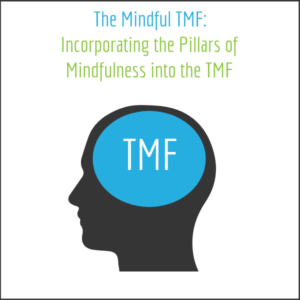 But practically speaking, if we are to incorporate mindfulness into TMF processes, we must understand the elements of mindfulness on a deeper level and understand how these elements interact with the day-to-day TMF experience. The best way to personally discover the meaning of mindfulness is through Kabat-Zinn’s seven pillars of mindfulness. These pillars: Non-Judging, Patience, Beginner’s Mind, Trust, Non-Striving, Acceptance, and Letting Go, describe the facets of mindfulness that come together to characterize the experience of mindfulness. Understanding these seven pillars gives great insight into the application of mindfulness in both personal and professional life. In the coming weeks we’ll explore these seven pillars of mindfulness through the lens of the ‘mindful TMF’, providing practical tips for creating happier and healthier clinical documentation stakeholders for a stress free and high-performing TMF.